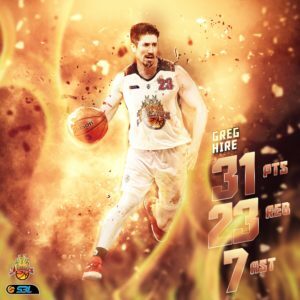 Greg Hire has waited until just his second game at Rockingham to assert his much-anticipated dominance, helping his squad to an 111-110 overtime win against the Lakeside Lightning. Hire and the Flames had just the one game for the Round, but it went the distance plus some, in a see-sawing clash at Lakeside Recreation Centre. Ending with an incredible statistical line of 31 points, 23 rebounds and 7 rebounds, Hire was unstoppable. Impressively, 10 of his 23 boards were on the offensive end. Furthermore, Hire was able to come up big down the stretch, scoring 6 of the Flames 9 extra period points, including a clutch layup and free throw to win the game. Another notable performance was that of Hire’s teammate Josh Ritchart, with the Flames big man scoring a game high 42 points. Consistent as always, Schwagmeyer put in two solid performances this week to lift her Lakeside Lightning to outright first on the WSBL ladder, with victories coming against South West (94-76) and Rockingham (102-82). 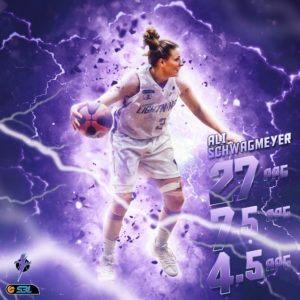 A toiling Slammers team had no answer for Schwagmeyer on Saturday, as she racked up 25 points, 11 rebounds and 3 assists in just 26 minutes of play. The tight turnaround on Sunday didn’t detract from Schwagmeyer’s work-rate, pouring in 29 points, 4 rebounds, 6 assists and 6 steals against the Flames at home. Schwagmeyer’s efficiency across both games was sound, shooting 61% on Saturday and 58% Sunday, with just 2 turnovers per game against her. Lakeside were +37 over the weekend with Schwagmeyer on the court. Original content from the SBL News room.